Let’s just say when the lovely Charlotte told me about Fox’s Rocky Peanut Butter Bars I went into a bit of an excited frenzy. Rocky bars were one of my favourite chocolate bars when I was a kid and a staple in my lunchbox. After searching 5 supermarkets, yes 5, I was still no better off until Charlotte saved the day, because she is totes amazing, and sent me a pack. These new bars come in an 8 pack, are a beautifully rounded price of £1.00 and are vegetarian friendly. The list of ingredients is scarily long so best not to dwell on that, however from observations no peanut / peanut butter is listed which both annoys me, as well as makes me apprehensive following the disastrous Peanut Butter Oreos. Shortcake biscuit bar topped with a peanut butter flavour cream, fully coated in milk chocolate. Per bar: 110 kcal, 3.5g sat fat, 8.9g sugar, 1g protein. Sweetness is definitely prominent and much more so than I remember. 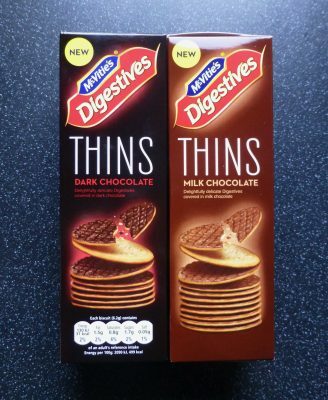 The thick biscuit layer was short, crunchy and crumbly, but not at all dry. The peanut butter flavoured layer runs through the middle of the Rocky bar, with a thicker layer in the centre from where the biscuit dips. The peanut butter cream did actually taste of peanut butter, a very sweet one, but pretty good for a synthetic version. Despite the sweetness these are pretty good and worth the wait. Fox’s are certainly onto something here with these Rocky Peanut Butter Bars, however there is room for improvement. With the level of sweetness a darker, more bitter chocolate would have worked slightly better, and obviously I would like to have seen actual peanut butter used rather than some synthetic alternative to give it a more true to nature flavour.